Second-quarter results were lower than expected, and the data analytics giant downgraded its sales outlook for 2015. What: Data platform giant Teradata's (NYSE:TDC) stock fell 21% during the month of August, according to S&P Capital IQ data. With that drop, shares are now sitting 32% below where they started 2015. Teradata's stock is down 60% from the all-time high it set three years ago. So what: A weak second-quarter earnings report was the main driver behind the August swoon. In that announcement, Teradata said that its quarterly revenue fell 8% to $623 million even as Wall Street analysts were expecting a softer 4% slide to $652 million. Teradata's earnings also came in surprisingly low, falling 2% to $0.53 per share. On top of that, overall profitability shrank on account of the lower sales base: Gross margin slipped to 54% of sales from 56% in the year-ago period. It turns out that prospective data platform customers are holding off on making large commitments to Teradata's comprehensive analytics and marketing offerings. At the same time, current clients are extending the time that they take in between major upgrade purchases. "The challenge that we have is that customers continue to invest in Teradata Data Warehouses, but overall, they are buying in smaller amounts," CEO Michael Koehler said to investors in a conference call. Now what: Teradata is making a number of changes to its product offerings to respond to the shifting shopper behavior, for example by breaking large platform suites into smaller, more flexible solutions. The aim is to make Teradata's solutions as easy as possible to purchase, even at a smaller scale. However, management sees the weaker demand trends continuing to hurt results through the year. In fact, the company lowered its full-year outlook to roughly 1.5% sales growth in 2015, down from the 4% target it issued back in May. Teradata also for the second time this year downgraded its profit forecast. Executives now believe 2015 earnings will be $2.35 per share, down from the prior $2.60-per-share forecast. Still, the company is expecting modest operating improvements over the next six months. 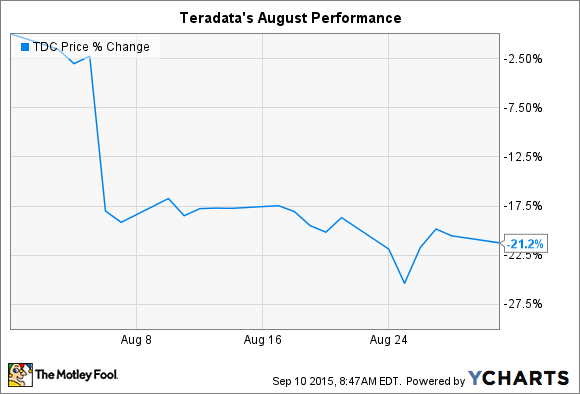 "We believe Teradata is positioned for growth in the second half of 2015," Koehler said. Yet investors don't appear confident that the gains will be robust: Teradata's stock is now priced at 17 times last year's earnings, for its cheapest valuation since 2011.